This lodge offers walking safaris where you can walk on foot with cheetahs – an unforgettable experience! We personally prefer slightly smaller camps then Chisomo’s 22 rooms – but hey, everyone’s different and you may well prefer the chance to interact with more guests! 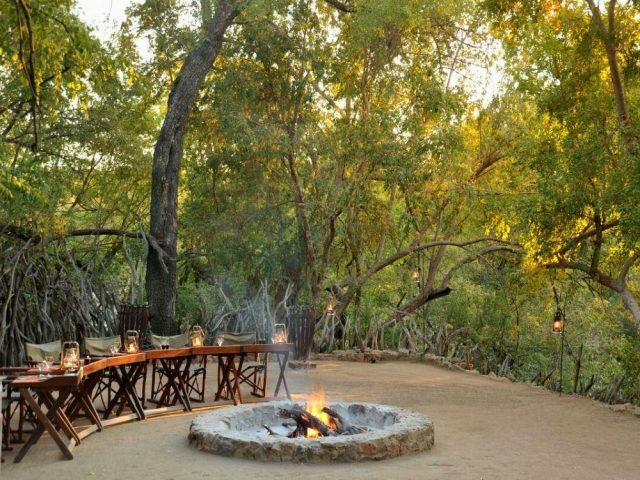 Chisomo Safari Camp lies overlooking the Makhutsi River and is tucked away deep in the Karongwe Game Reserve in Limpopo. Covering an area of some 9000 hectares of pristine African bush, Karongwe is rapidly building a reputation as an excellent value for money and high-quality Big 5 game experience. 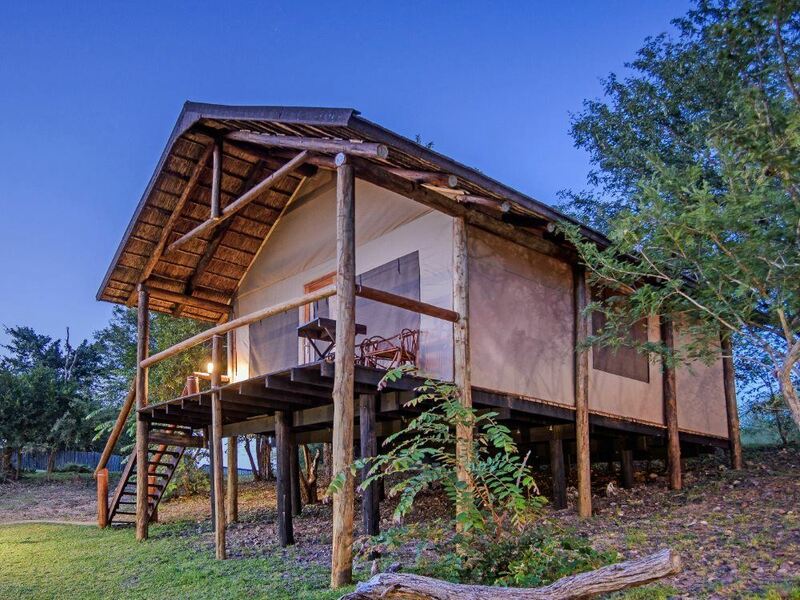 Another big plus is that Karongwe is the closest of the greater Kruger private reserves to the soaring Drakensberg escarpment in the west, so you’ll enjoy stunning scenic views of the mountains as well as the prolific wildlife in the reserve! There are 4 different lodge options at Karongwe and Chisomo (previously known as Edeni Hoyo Hoyo) is the most rustic and simple of them all with its 22 fairly basic tented rooms. Whilst simple, the camp also manages to radiate a true feeling of being in the wilderness and sharing the land with the animals. The 22 tents are all located on wooden platforms situated under the shade of towering knob thorns and Jackalberry trees overlooking the Makhutsi River - here grazing nyala and warthogs will likely greet you in the morning as you emerge from your tent. 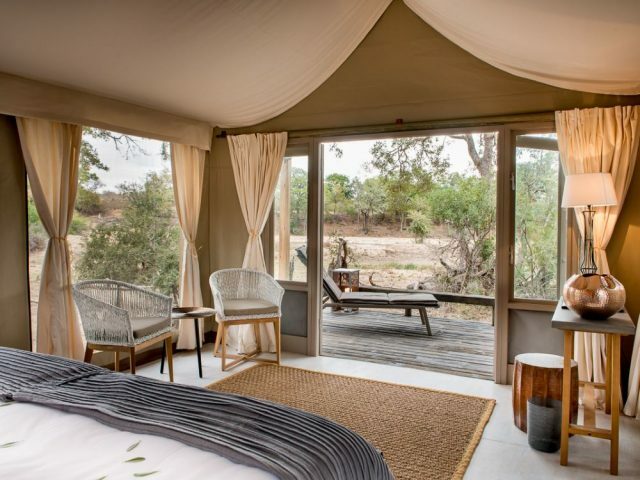 There’s no lack of romance either – there’s something about luxuriously decorated tented suites draped in crisp canvas with dark wood finishes that creates an atmosphere that harkens back to the old golden years of colonial safaris! They might evoke a feeling of nostalgia but the good news is that the tents are really comfortable and pretty well equipped with many of today’s modern necessities – take the rich African toned en-suite bathroom as an example. There’s something about spending a night under canvas with the sounds of the bush lulling you to sleep, that seems to make you feel more connected to the bush outside than in a normal room (especially if those sounds include a lion roaring nearby when your heart will definitely beat a little faster!) 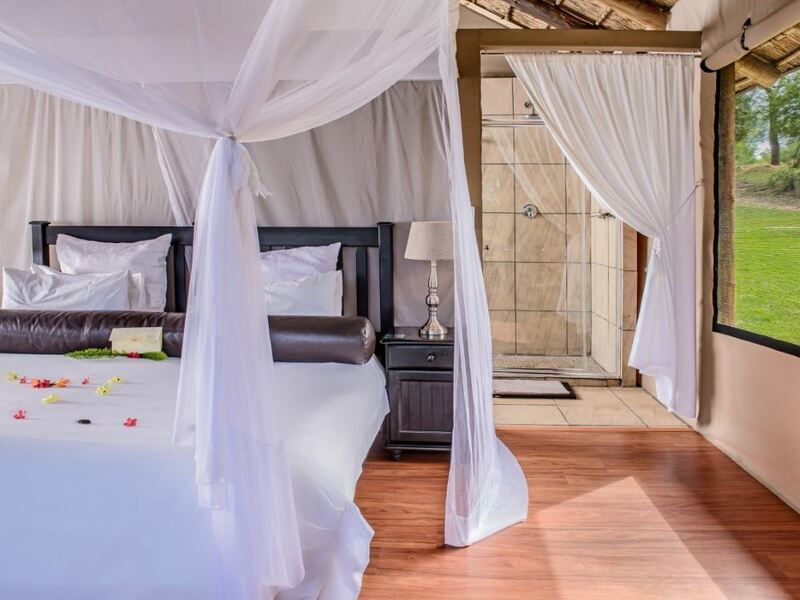 One thing to note is that there is no air-con though so if you feel the heat it may be worthwhile avoiding the hotter summer months, or alternatively opting for one of the more conventional luxury camps in the Karongwe portfolio. 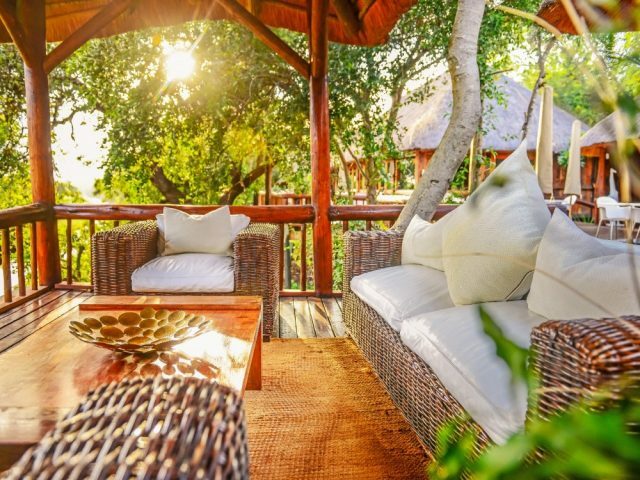 During the day you can relax and retire between game drives to one of the beautifully decorated lounges all furnished in true outdoor style with burnt oranges, reds and cream throw cushions scattered on welcoming couches – they’re the perfect place to chill out with a good book and perhaps a bit of bird spotting before you start slumbering! The lodge’s sparkling swimming pool is the perfect place to escape the heat of summer’s days. Another lovely option is to take a leisurely walk to the end of the lodge's path – here there is a hide that has great views of the nearby watering hole! The open vehicle game drives are perfect for game viewing, where you can also enjoy a sundowner while the sun sets over the magnificent Drakensberg. The outstanding wildlife sightings and spectacular landscape makes for the perfect photographic opportunities with shots of the Lowveld from a “kopje” amidst the lush vegetation. One of the unusual activities available at Chisomo is the chance to view cheetah by vehicle or on foot (walking safaris are also on offer) Heading back to the camp you’ll enjoy traditional hearty African meals in the most spectacular surroundings, under the stars in the boma or in the elegant candlelit dining area – if you're looking for back-to-basics romance then Chisomo provides this in abundance!